The Playtime Analysis report helps you understand whether your students are getting the appropriate playtime in. 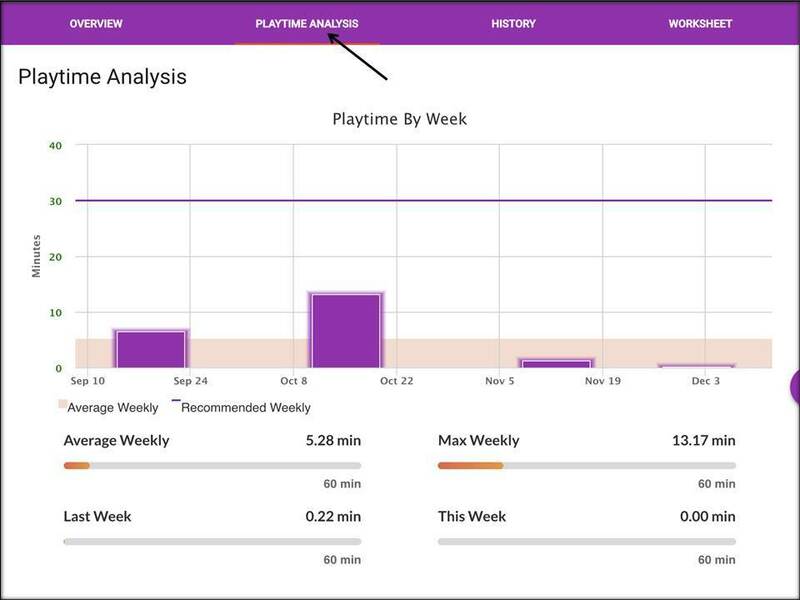 We graph, by week, the amount of playtime done each week using the purple bars. The average weekly playtime is given via the background color. We also provide a guideline at 30 minutes so that you know how the average compares to the recommended average. On average, children in our system learn 1.5 years of mathematics over the course of 10 weeks when they use the system 30 minutes per week. We measured this by looking at the total playtime of students, filtering to children who played over 20 minutes and averaging the difference between their Starting Elephant Age and Elephant Age at the end of 10 weeks. The average playtime was 30 minutes, and the average difference was approximately 19 months. No children in that sample had learned less than 1 year of mathematics. That is why we guarantee that children will learn at least 1 year of math in 3 months if they use the system an average of 30 minutes per week. Copyright 2019, Elephant Learning, LLC.